Indiblogger sent me an email 3 months back telling me about the IB 2017 awards. I’m a work-in-progress and blog once or twice a month, so I didn’t think I’d have much chance. But when I looked through their site I realized they had many categories. “If I can find a category with 2-3 entries, maybe…” I said to myself. I discovered they actually had state-wise categories, and Uttarakhand had only 3 entries. Bingo! I submitted my entry and crossed my fingers. Then they emailed me again, saying I could nominate my blog for four other categories (with three posts required for each category). This time I thought of three appropriate posts in each category and submitted. But I still had my hopes pinned on Uttarakhand. India is a big country, and Indiblogger has over 25,000 registered blogs. What chance did I have? 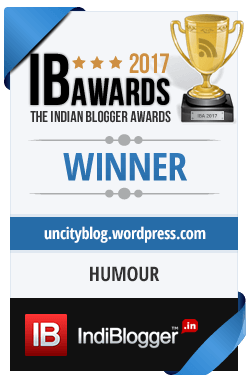 So when I heard that the Uncityblog had won the Indiblogger award for the most humorous blog in the country, I thought I was having a “La La Land” Oscar moment. But they actually had us on their website at www.indiblogger.in/iba/2017/winners/literature-personal ! I actually think this is more of a lifestyle blog. When you look through this blog you’ll find that many posts aren’t that funny. But I guess some must be funny enough. To check out the funny ones you will have to go to the category of “Funnies” (duh! ), and get someone to tickle you. Anyhow, since we’re here now, I am sharing some of my personal favourites below. If you think they’re worth much and would like to hone your writing some more, come to one of our writing or blogging retreats. You can check those out at http://www.himalayanwritingretreat.com/ .